What I do know is that the board is running at 29°C (at idle) with only the CPU cooler fan currently connected. If it gets over 50°C ~ 60°C (under load) I'll add fans (my case has 3 now). Florida never gets to -100°C. My ASRock H61M-HVS (CPUSocket) (in this computer) is running at 43° C with only 2 case fans. I'm not a road warrior so I don't need Mil-Spec. Three fans? Only 3 Fans?! You got horseshoes, Man, in a very uncomfortable location. I'm running 5 Fans in my Skeletonized Mini-Tower (16"H x 17½"D x 7"W). Don't ask me who made it; the info's on the back and I have zero inclination to move it). Under Normal Load, which is the same as "Full Load" on account of the fact that I don't have Firefox 1.0.5.0, she's running at ~40°C. I'm not a road warrior so I don't need Mil-Spec. You might not need Mil-Spec for your Motherboard, but you've got it anyway. I'm a "Military Certified" Printed Circuit Board Artist who's designed Multi-Layer Printed Circuit Boards for the Businesses and Militaries of: Canada, United States of America, Germany, United Kingdom, Sweden, Norway, Finland, Israel, Republic of Czechoslovakia, Hungary and Ukraine. But none of this is shown on my Business Card for the simple reason that it takes up too much room. Other than my Name followed by: C.E.T., Ph.D., there's nothing else on my Business Card except my Corporate Logotype and Company Name. Why would anybody put two Motherboards in one case? Let me see if I can answer my own question. If a person needed to double their available RAM then how would they tie (for want of a better term) the two Mobos together? A Master/Slave CPU combination? By the way, your link crashed my System. Damn but I need those new Installation Disks! TB? If you're readin' this, I need those Disks more than I need a Chair. That's the same link I used when I bought my motherboard. Maybe you should switch browsers or re-install the your present one. I misunderstood you. I thought you were asking if there was room in my case for two boards. I couldn't figure out why you would want to. Why would you ask me if my board was Mil-Spec if you already knew the answer? In other words, switch Mozilla for Mozilla or reinstall Mozilla. I didn't ask you if it was Mil-Spec. I asked you what it was made of (could've been compressed bark, for all I knew). Glad you snuck that RMA in before time ran out. Anyhow, looks like everything is working well at this time which is good. Thinking about throwing something together myself in the near future, I have 2 X Asus Matrix 5870 Platinum RoG and 16GB Crucial RAM so far, was also thinking of the 4790k and possibly a Sabertooth board. I know I'll need a boat load of PSU for those cards, at least 800 watts and 70-80 amps across the 12v to cover those cards, not to mention I need 4 x 8 pin PCI connectors. Don't want to further hijack your thread so I'll leave it at that. Al, your informed posts are always welcome in any thread I start. I was looking at the system requirements for your cards. These aren't normal 5870s though, if you look on this page you'll see the dual 8 pin PCI ports, I believe the article says that a 6 pin to 8 pin adaptor works, I may even have them in the suitcase sized boxes these cards come in. Yeah that's the same as my 7870 (2 - 8 pin connectors). A second card requires you to add another 188 Watts. You need a 700+ Watt power supply unit if you use it in a high-end system (800 recommended). You've actually had Molex Connecters let go? I think the problem there is 2 molex connectors for each PCI-E cable. To get full power they can't be piggy-backed. SeaSonic S12G-750 750W ATX12V / EPS12V 80 PLUS GOLD Certified Active PFC Power Supply $99.99 USD. Haven't looked at Newegg.ca yet. Not let go but the female connector pins expand and create intermittent current flow issues, this is more of a concern when trying to flow higher amounts of current through the connector. My current PC does not have a molex connector attached, I have them bundled up on the back side of the case. That SeaSonic looks interesting, I thought I'd have to pay substantially more for a PSU that natively supplies 4 x 8 pin PCI connectors. Yikes! This is expensive in Canada. Aargh, my 700W modular OCZ PSU failed, 3 months out of warranty. I threw a generic hard wired 750W Logisys PSU in my build for now. What a mess. The 8 pin power cable is too short to run under the motherboard and just fits over the top of the video card. The 24 pin power cable is too short to hide too. Cable management is a bad joke. I'm looking at the EVGA SuperNOVA 750 G2 220-G2-0750-XR 750W ATX12V / EPS12V SLI Ready 80 PLUS GOLD Certified Full Modular Power Supply with a 10 year warranty for $121.99 USD. On the positive side, though I haven't connected the front panel connectors, I threw Windows 7 Ultimate on the SSD and it boots in about 13 seconds from the time I press the power button on the motherboard. Hmmm, not so good news, maybe OCZ will do something for you given it's a high end unit and just out of warranty. I'm not sure if we had this discussion back in the latter days of D, but I do think that OCZ is not a reliable PSU. IIRC it was BlackCats that did some pretty heavy load testing on these units with undesirable results, but that was some time back. Thermaltake are another PSU I would avoid. Good ole' Corsair, SeaSonic, and Antec. I have also heard good things about EVGA, although they always appear to be out of price range when I'm looking. I love(d) my SSD, but I gave it to the stepson last year. His system is about the same, 15 or so seconds, but when I had it with a clean install of Win 8 it booted for me in less than 10. maybe that's a sign of things to come with new OSs. Wish I knew that 3 years ago. When OCZ was in the process of filing for bankruptcy Toshiba bought OCZ's SSD business. As of February 12, 2014 FirePower Technology has acquired the power supply assets of OCZ Technology Group and PC Power and Cooling. Firepower Technology has announced that it plans to honor the warranty obligations of its installed base and will operate out of the company's facilities in Carlsbad, California. I have my new computer up and running but I'm afraid to install my video card. 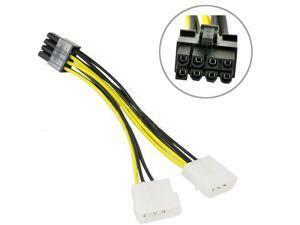 The PSU has a cable with 2 x 6+2 pin connectors (advertised as 1 x 6-Pin, 1 x 6+2-Pin PCI-Express Connectors). My card requires 2 - 6 pin connectors and I don't know if the split cable is enough to safely run the card. Until I decide to try it or get a proper PSU I'm stuck with Intel HD Graphics 4600. I threw the Logisys 750W PSU in my new PC and got a black screen until I connected the monitor to Intel HD Graphics 4600 Integrated Graphics. I was worried that it borked my Radeon 7870 video card. Swapped out the PSU with an Antec 550W PSU and got a screen. I can't find the Sledge-O-Matic but I have a 28 ounce framing hammer I can use to tune up that POS. What kind of CPU does it take to get a 7.9 Windows Experience Index rating? Maybe when you get your new PSU you can turn up the wick a bit on the CPU and see if you can get a 7.9.